The American Academy of Spine Physicians (AASP) offers its members some of the most unique educational resources and tools available in the healthcare field. 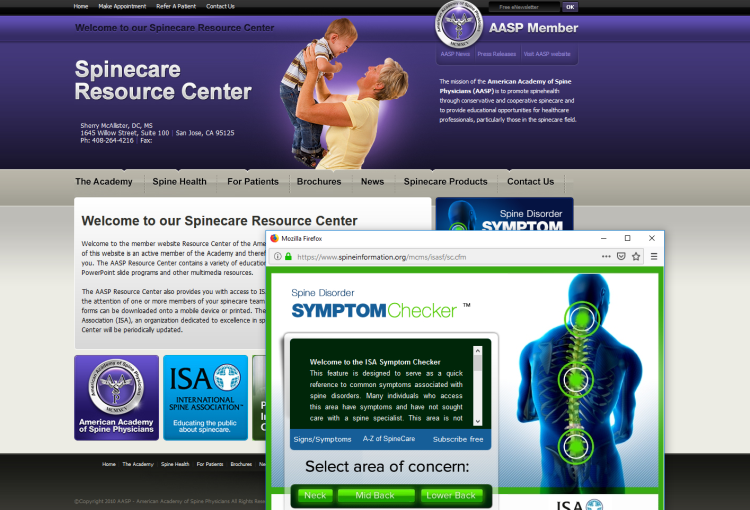 Many spinecare providers have existing practice websites; subsequently, the AASP designed a database plug-in which can be accessed through an attractive click through "Active Member" icon/logo placed on an existing website. This resource is referred to as the Plug-in Spinecare Center (PSC). This educational resource provides access to selected resources of the AASP, a graphic representation of the provider's membership certificate (optional), and links to selected resources of the online Public Information Center (PIC) of the International Spine Association (ISA). The PIC is a large online multimedia database of information about the spine, spine disorders, and available spinecare. Individuals can be directed to access the PSC through the member's practice website. Patients will be encouraged to return to the PSC to look for new information and to learn about emerging treatment options. Patients become motivated to refer friends, family, and others to the AASP member website and PSC for accurate information about the spine, spine disorders, and available spinecare. The PSC can be accessed 24/7 and can be displayed on a standard computer monitor, flat plasma screen, HDTV monitor and on mobile devices. Keep your patients informed, expand your practice website resources and enhance your role as a spinecare provider and educator. Spinecare professionals of all disciplines should take the necessary steps to serve their patients better by expanding the breadth and depth of multimedia content on their practice websites. This includes providing access to resources, which keep patients up-to-date with need-to-know information through a trusted source, such as their practice website.